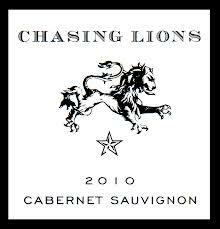 A new shipment–featuring this Chasing Lions 2010 Cabernet Sauvignon, North Coast–arrived Wednesday and we nearly made it to the weekend before sampling this new red. Thursday night we had our first exposure, and it was a good one. Pulling the cork unleashed a deep, earthy scent. Definitely Cabernet Sauvignon undertones, with the richness and dark berries, and in this one we also got a whiff of an “aged barrel” scent. Great first impression, with a cherry(?) berry flavor mixed with a dark rawness…that soil kind of vibe that I first mentioned above. It seems intentional to this observer. The Lions has a smooth finish, and less of a tobacco or spice feel that I’ve described in other recent Cabernets in Notes of Note. Those type of nuances are what sets apart a “good” Cabernet like this one seems to be from others I’d call “great”. Interesting as well: We often take down a bottle over the course of two evenings, recorking for the night. Most have equal or better value the second tasting, but the Lions notably did not. Will be interesting to see if I have a different take next time, assuming we partake over just a single tasting. Stay tuned for more!